Senate Administrative Rules definition reads: "Provincial residence" means a Senator's residence in the province or territory for which the Senator is appointed. B: There's no definition of "primary residence"? A: No. // B: There's no definition of "secondary residence"? A: No. B: There's no definition of "primary residence"? A: No. B: There's no definition of "secondary residence"? A: No. A: For the purposes of SARs, used terms "provincial residences" and "national capital residences". No definitions of primary or secondary residences. We're on a 15 minute break until 3:30. B: Will you agree that there's no definition/requirement on length of time in province? A: Right. B: Listing questions/criteria: no criteria of # of nights, percentage, seasonal requirement, which house owned longer, which house valued more, type of structure, cottage/seasonal structure? A Says there are no criteria/requirements for each. A: Cautions/argues that while there are no one criteria for provincial residence, you do have to be present in the province. Troubling that LeBreton memo says you can be in Ottawa for 99% of time. Bayne later goes on now about "Senators' living expenses in the National Capital Region guidelines"
A: When we're getting into guidelines and policies, outside of my expertise. I deal with statutes. Guidelines dealt with by HR/Finance. B:You're not here as expert witness. If you can't answer, say so can can be relevant. Judge says Audcent is a very capable witness and will be allowed. A: When I'm looking at these guideline, my guess is it went back to 1998 report. It used the language back in 1998... so there is a link. Bayne: New foundation, windows, etc. That's indicator for property? What does Duffy's lawyer say about Brazeau's presence? "It's news to me and it isn't something we've arranged." The day today will start with the continuation of defence's cross examination of crown witness Mark Audcent, former Senate law clerk. 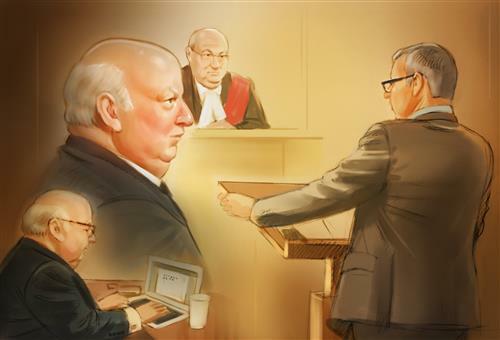 Crown witness Sonia Makhlouf‎ of Senate human resources is expected to be called to the stand once Audcent's testimony is finished. Re: sentence in memo about being in Ottawa 99% of the time. A: "in the context of whether it will be raised in the Senate, it makes perfect sense." On the 1998 Internal Economy report Audcent says this is the first time the term "Primary Residence" is mentioned. A: "I don't see a definition of primary residence in the guidelines." "I don't see any helpful or clarifying criteria"
B: Did you play any role in changes on the declaration? A: I don't recall about being involved in changes on this from. Audcent, though, says he was involved in 2013 SARs (Senate Administration Rules) changes changing the term "National Capital Residence" to "National Capital Accommodation"
Bayne shows current 2015/16 forms which uses the term "provincial/territorial residence" and not "primary"